For your spring-time pleasure and just in time for Easter we’re offering our newsletter readers 25% off any of our cut bouquet flowers. Tell the cashier the PROMO CODE “happiness” and the price will be reduced at the cash. This offer is valid until Sat. April 19, 2014. 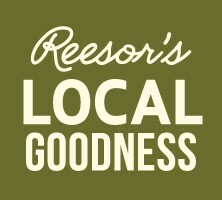 Reesor’s Market & Bakery – 1 Year Anniversary Celebration!